BlindType has had a long history in Android. Introduced to the public exactly two years ago in August of 2010, it was quickly snatched up by Google, then implemented into what we now know as the Ice Cream Sandwich keyboard. Well, the creators still aren’t done innovating quite yet. Recently released for iOS and coming later for Android, is Fleksy. 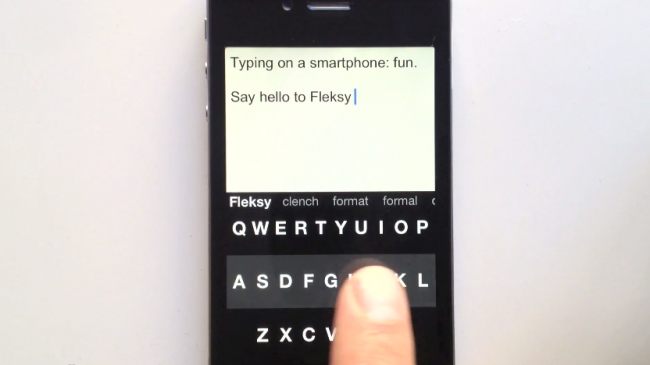 Fleksy is a new replacement keyboard, designed for the blind and partially sighted users. But don’t worry, if you’re able-sighted, use of the app can benefit you as well. The goal as stated by the developers is to make typing fast and easy. One of the ways this will be made possible is to allow for users to type wherever they want, with no actual keyboard on the screen. One of the more remarkable features is that when typing a word, you don’t even have to get a single character correct. Magically, Fleksy knows what you’re trying to type and auto-corrects it for you. Another nifty looking feature is a swipe to delete action that they show off in the video below. It’s going to be pretty awesome from what we see in the video, so fingers crossed it makes its way to Android sooner rather than later! Phosphor Game's Horn Launches for Mobile Devices, Coming to Android "Soon"